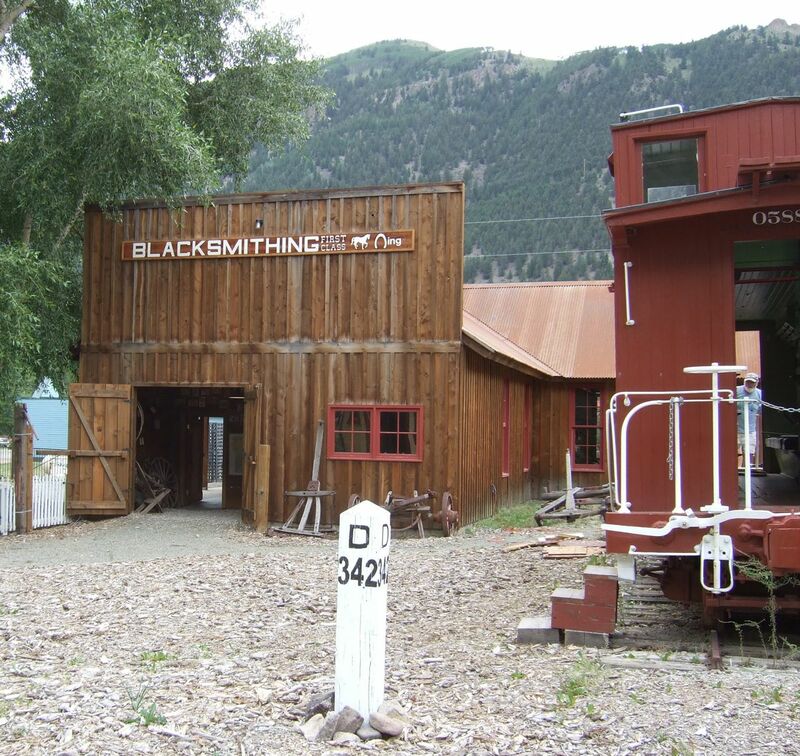 The Colorado high country is home to old mining towns. Lots of them. 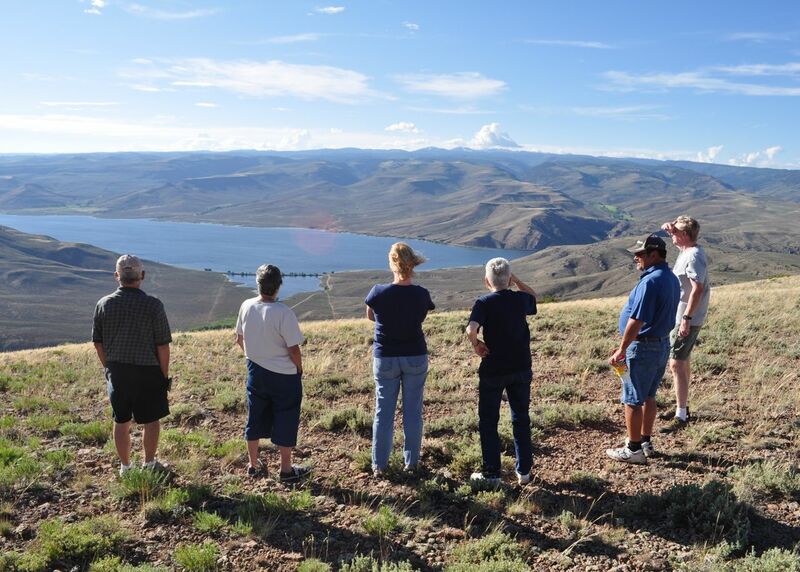 About 50 miles southwest (and nearly 1,000 feet up) from Gunnison is Lake City. This alpine gem covers nearly three times as much ground as Pitkin, and is home to about 350 year-round residents. 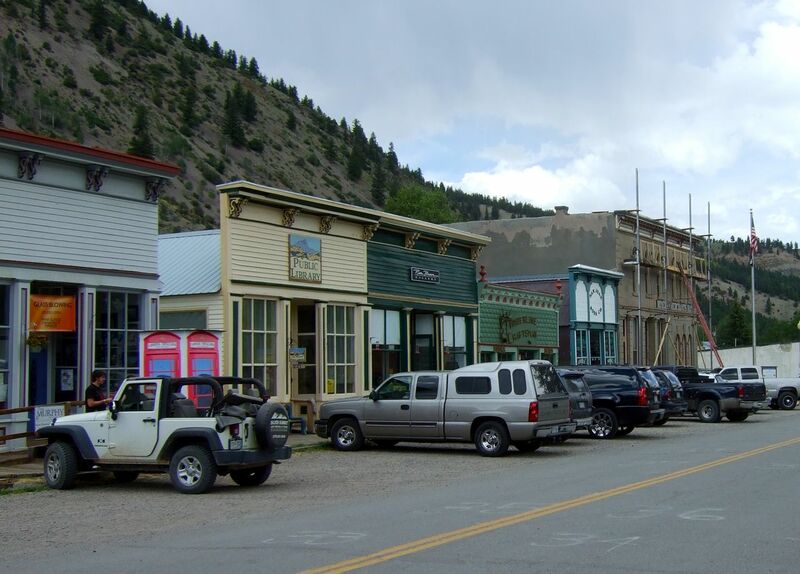 The Lake City Historical District contains many of the more than 200 buildings that remain from the 19th century mining boom. Today, most of these buildings house cute little shops that attract summer tourists. ...has a sense of humor! Lake City is quaint and quirky. Its efforts to preserve its history are obvious in places. 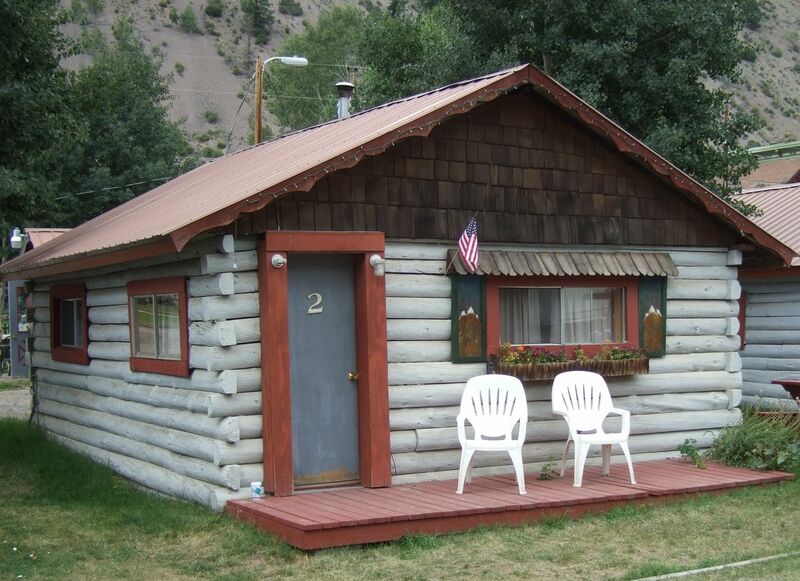 The town is loaded with cozy cabins where visitors (most of them Texans) spend a few days or the entire Summer. 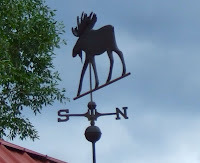 One house sported a whimsical weather vane that we were so tempted to take home with us. The reason for our visit today was to track down a couple we met last winter in Kerrville. 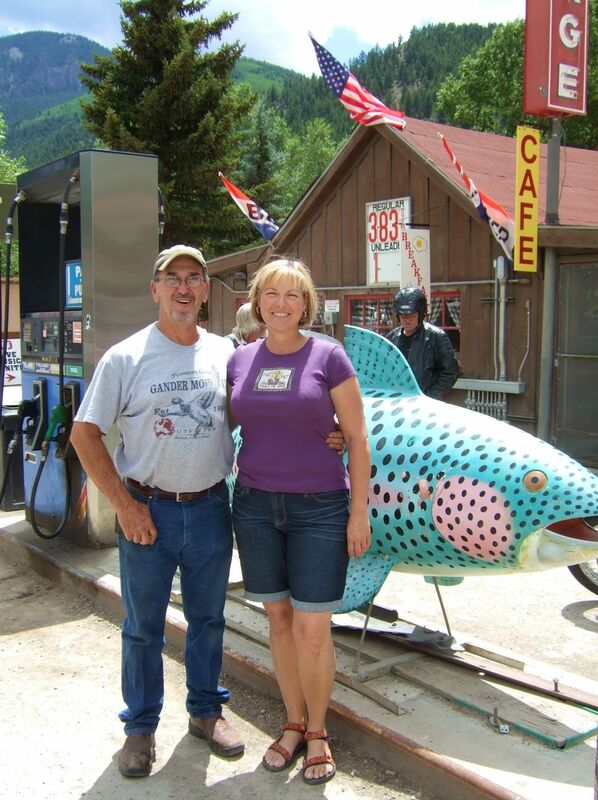 When Hutch and Roxa told us about their gas station/garage/concert venue/barbeque joint, we found it hard to believe that such a place could really exist. 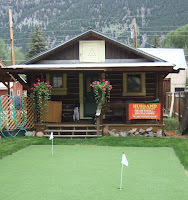 Just past the historic district and over the creek, we spotted Sportsmans BBQ & Backyard. Sure enough, there are a couple of gas pumps out front! We stepped inside what once was a Texaco station and caught a whiff of Texas barbeque. We were greeted by Hutch and Roxa and caught up over a couple of tasty sandwiches. After lunch, they took us out back and showed us the garage (complete with a full-time mechanic) and "the backyard", a 300-seat concert/dinner venue. This year's Backyard Concert Series featured Suzy Bogguss and Michael Martin Murphey. Snuggled up to the base of a mountain, this intimate setting makes a great venue for dinner and music under the stars. 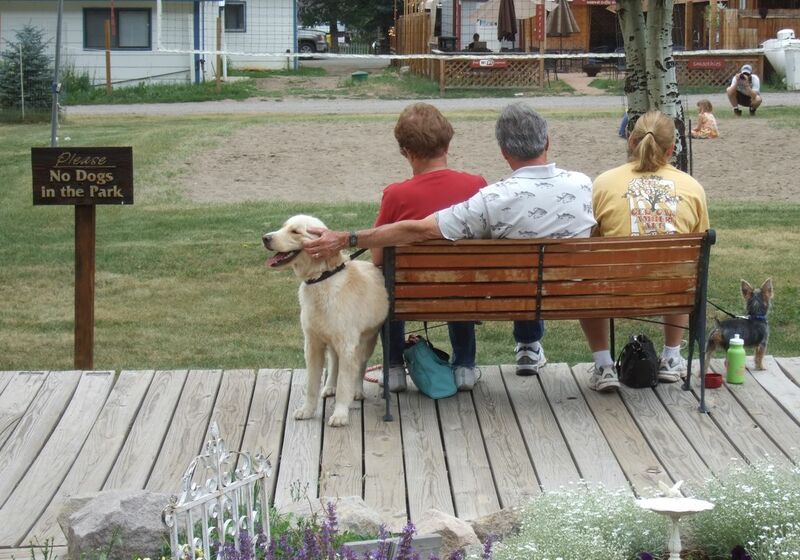 It was such a treat to see Hutch and Roxa in their Colorado home. We look forward to seeing them again in Kerrville. 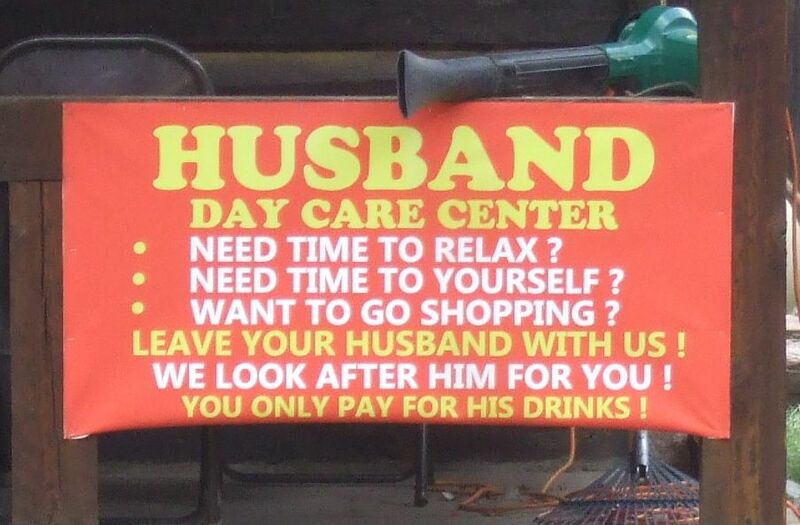 And, the next time we hear them talk about their quirky place, we'll believe them! Before heading back to Gunnison, we went up the road just a bit to visit Lake City's namesake. 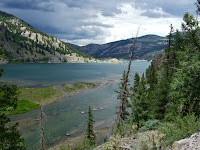 Lake San Cristobal is the second largest natural lake in Colorado. 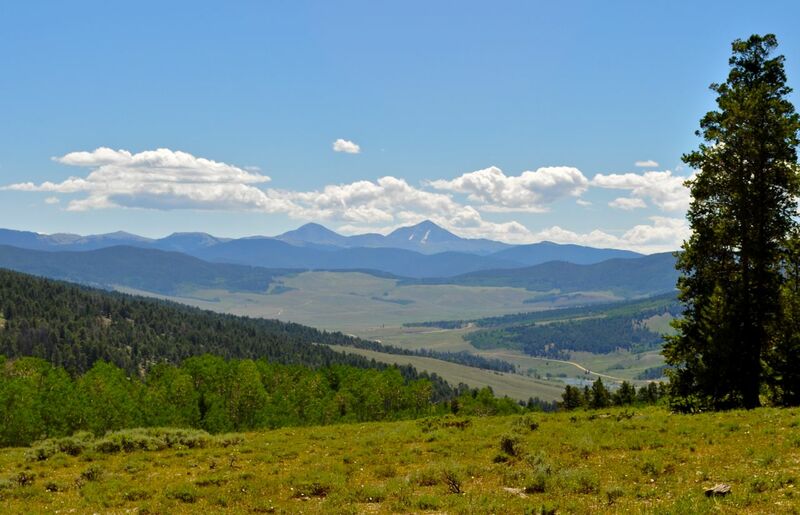 Created by a landslide some 700 years ago, this sparkling jewel of the San Juan Mountains is picture perfect. Afternoon storms were brewing, so we cut today's visit short. But, we very much look forward to coming back! 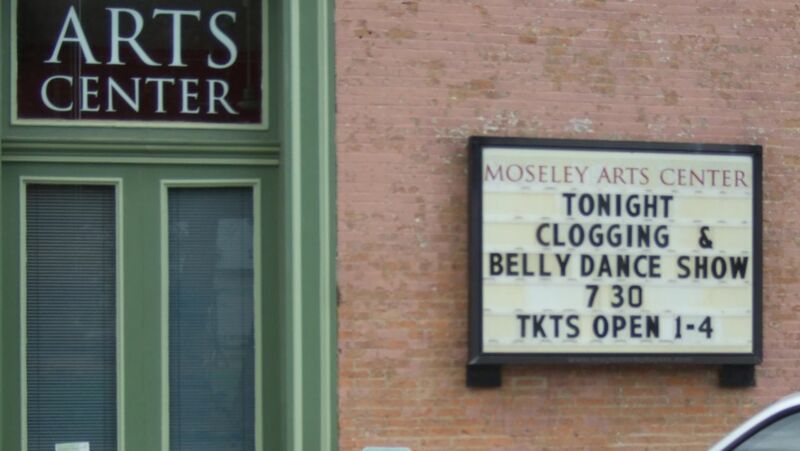 Thanks to our neighbors Bill and Pat, we were treated to an evening of breathtaking entertainment. 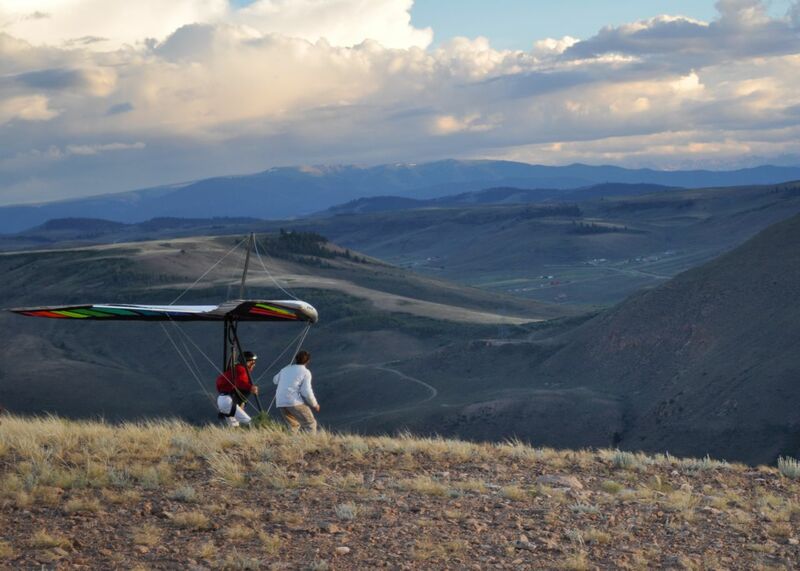 Bill had been in touch with some local hang gliders who let him know they were planning to fly late this afternoon about 20 minutes out of Gunnison. He invited us to tag along. So, of course, we did! 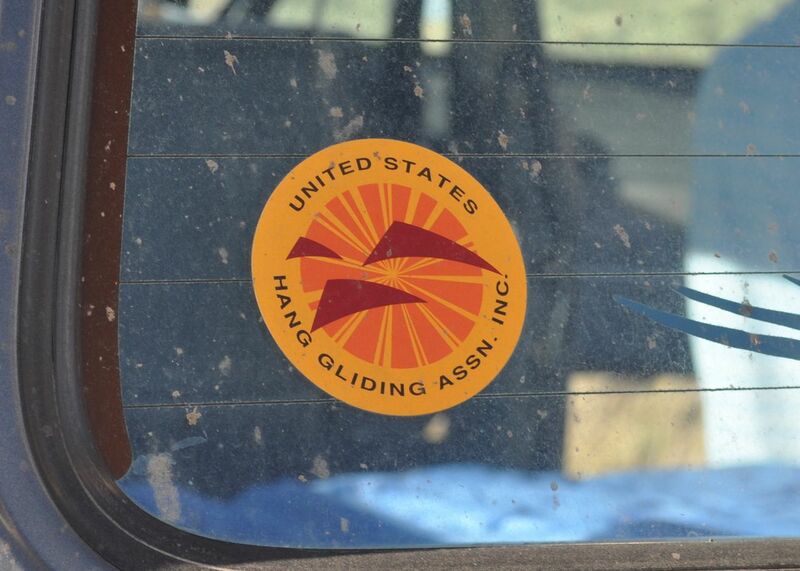 No, these aren't the hang gliders! 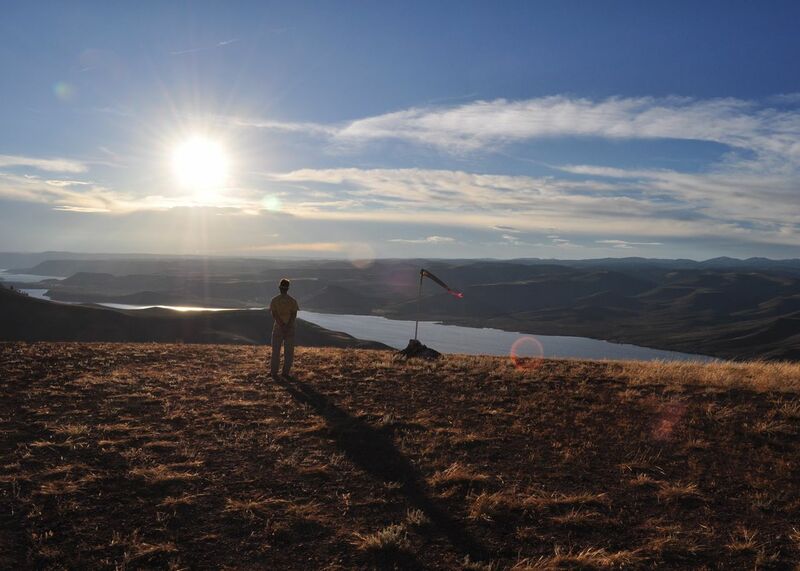 Our spectating crew from the KOA surveyed the takeoff area over beautiful Blue Mesa Reservoir, which is the largest lake in Colorado. 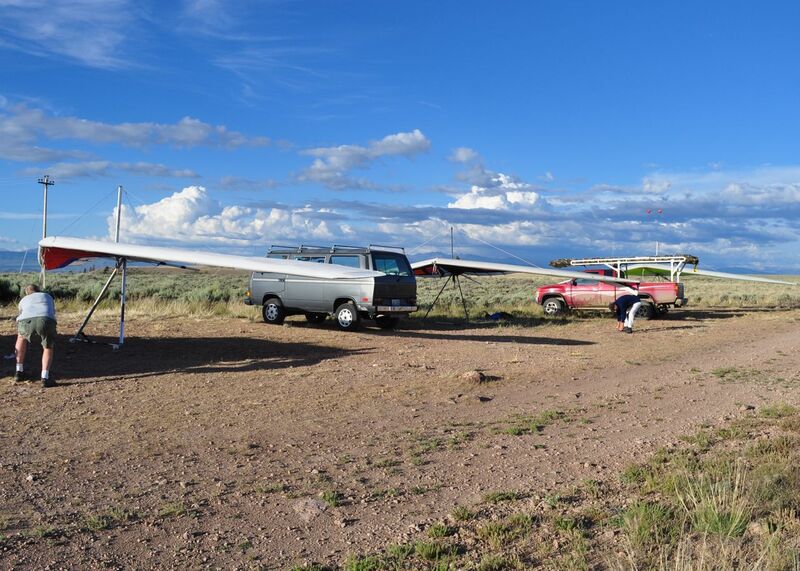 Four hang gliders arrived, and three of them went to work setting up their gliders. 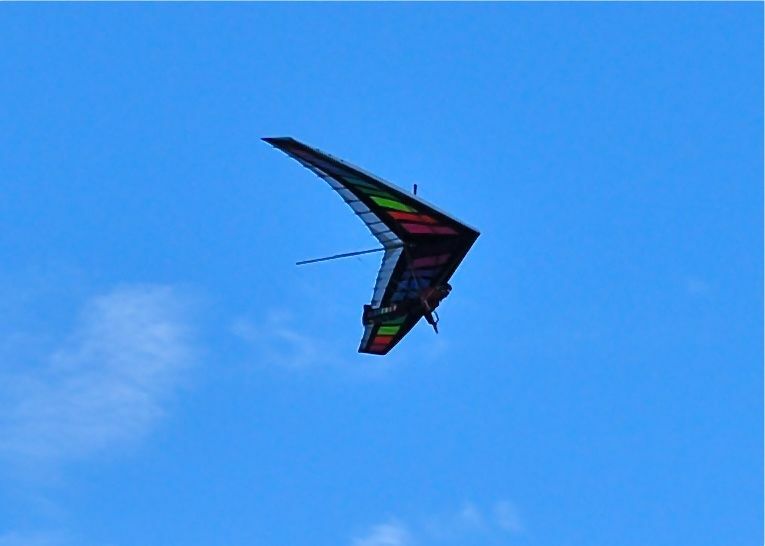 With the "wings" extended, they started to look like hang gliders. 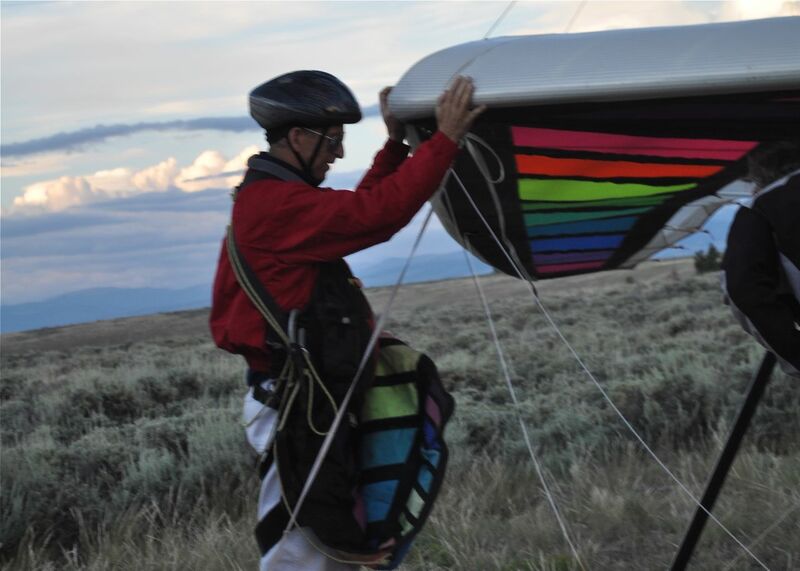 This pilot was quick to tie down his glider as soon as the wings were out. This thing could become a big kite in a heartbeat! 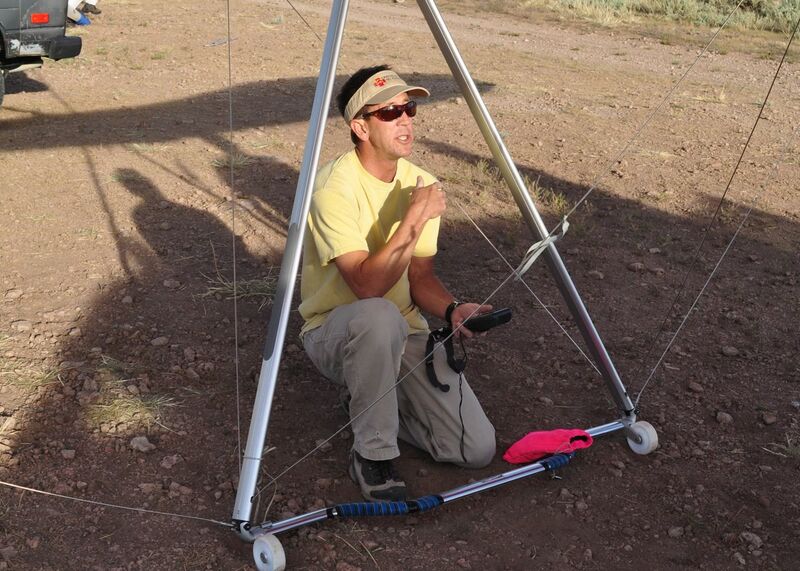 Next, it was time to install the "instruments", which helps the pilot monitor altitude, wind speed and direction. 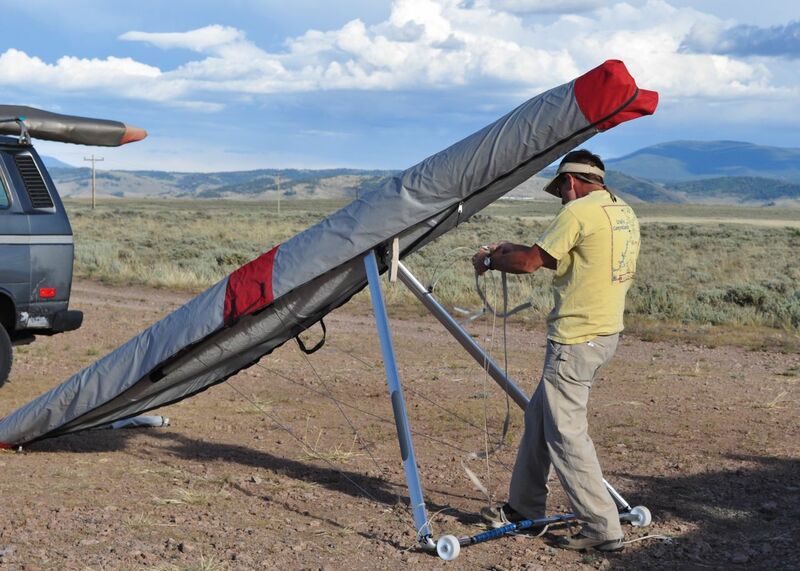 The three gliders were set up, tied down and ready to fly. 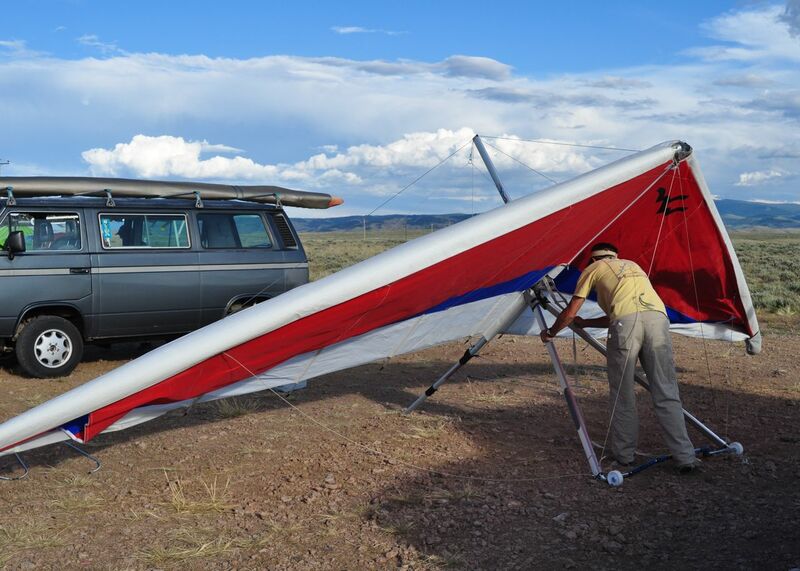 The full windsock at the takeoff point offered good and not-so-good news. 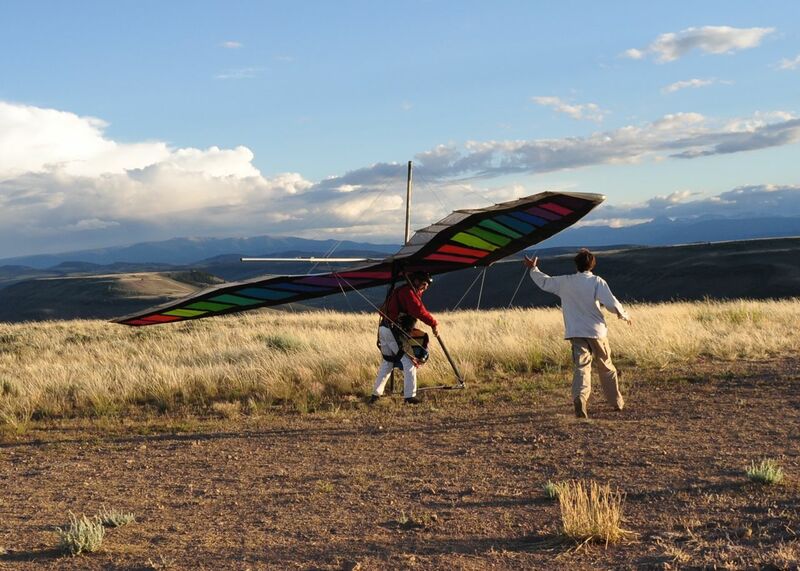 The good news is there was plenty of breeze to fly, but maybe a bit too much. Plus, it was out of the wrong direction. 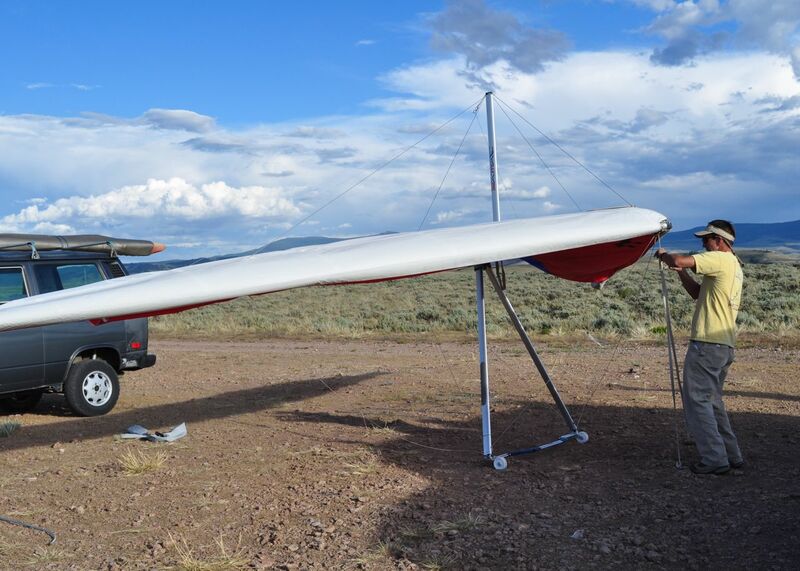 "Sometimes we call this 'hang waiting'," explained one pilot as he stood patiently waiting for the wind to calm down and straighten out. 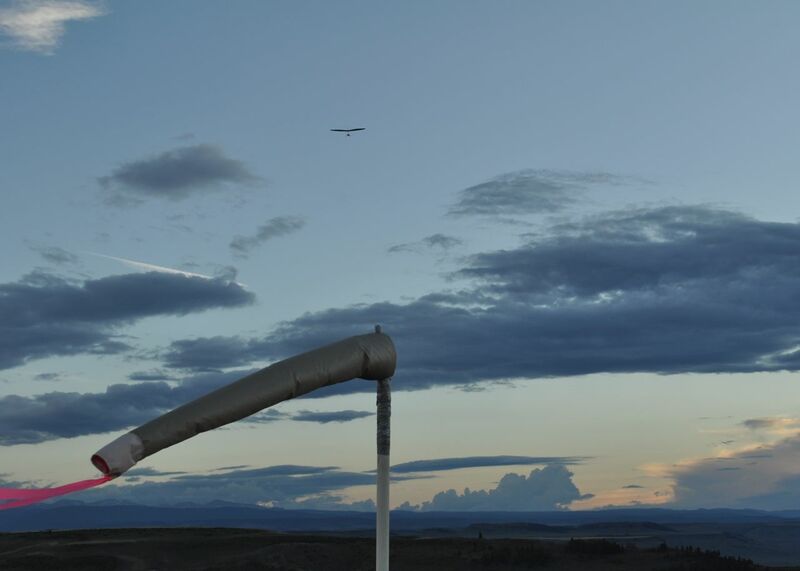 With less than hour of daylight left, one pilot decided it was time to get on the "runway". Perched on the bluff, he was ready to catch the cool Colorado breeze. A couple of steps and he was off! He sure made flying this thing look easy. 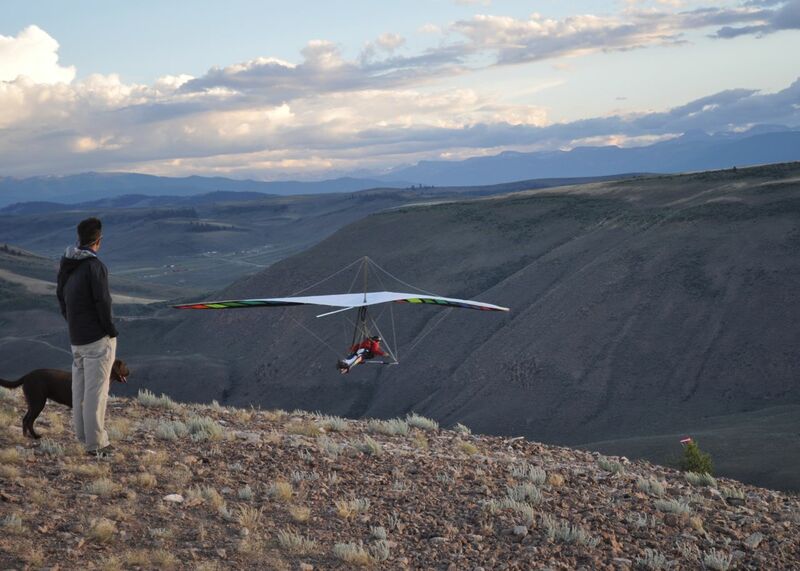 Can you spot the hang glider high in the sky? 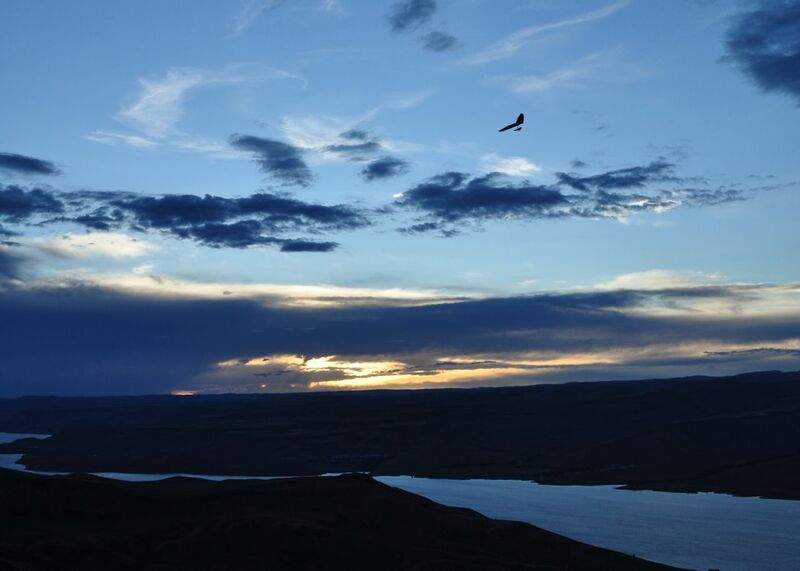 We really enjoyed this stunning sunset over Blue Mesa, but his view had to be even better. Soon he made a quick flyover the takeoff site. He circled around to make his approach. Now, that was a smooth landing! And who was this mystery pilot? 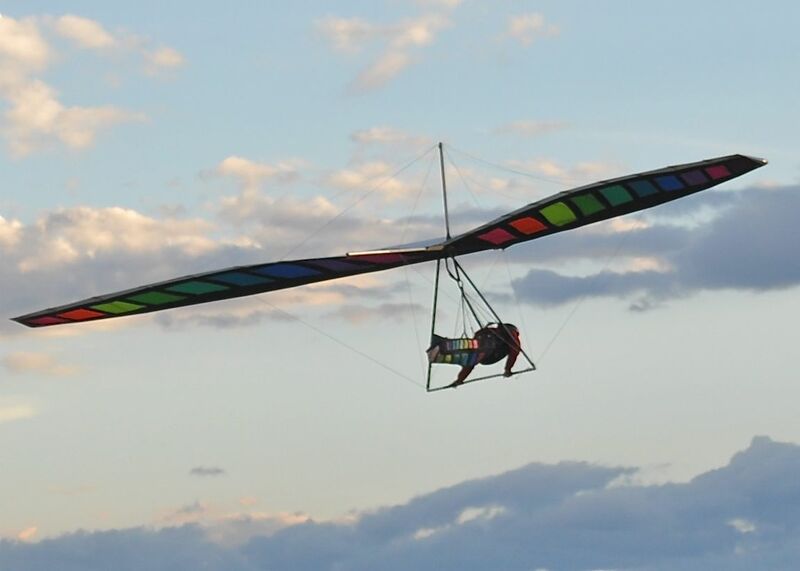 John Heiney, world champion freestyle hang glider pilot and world record holder of continuous loops in one flight. That's 52! And how old is this super daredevil? 62 years young! Good to know. We have a few years yet to take up flying, if we we want. 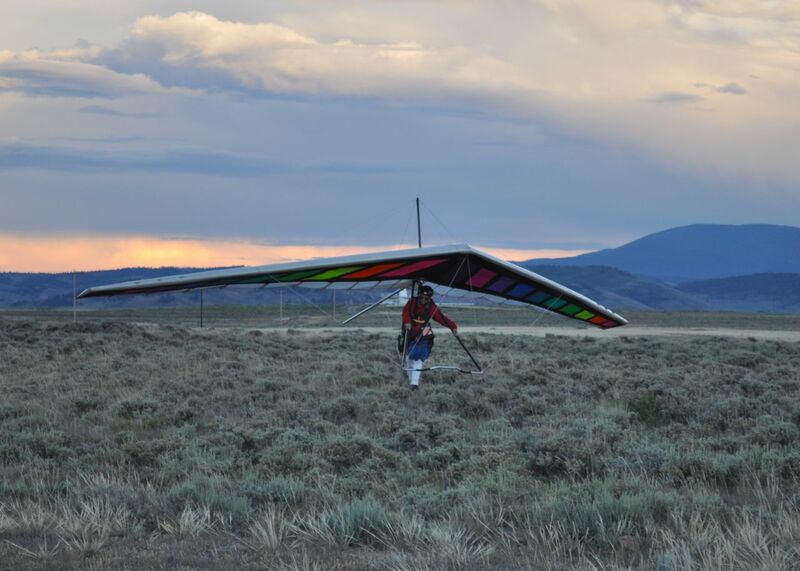 For now, hang gliding will remain a spectator sport! We have definitely found relief from the heat here in lovely Gunnison, Colorado. We've been here for a couple of weeks now and are loving sunny days that sometimes top the 80-degree mark and nights that drop off into the 30's. We've been having so much fun here we just haven't found time to blog! Today was another installment of Rocky's Wonderful Adventures in the Rockies. 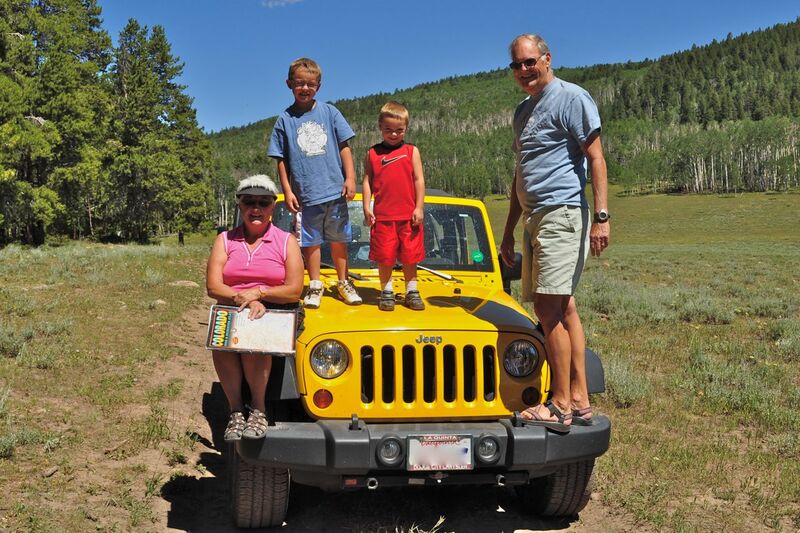 We joined KOA neighbors Karen and Arvin and their two grandsons to run our Wranglers up the mountain to the town of Pitkin. 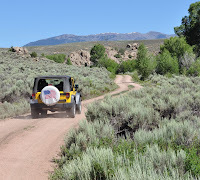 We headed about 20 miles east of Gunnison to County Road 887. It's neither the most direct, nor the smoothest route. But, it's definitely scenic. The Jeeps loved it! And, so did the boys! 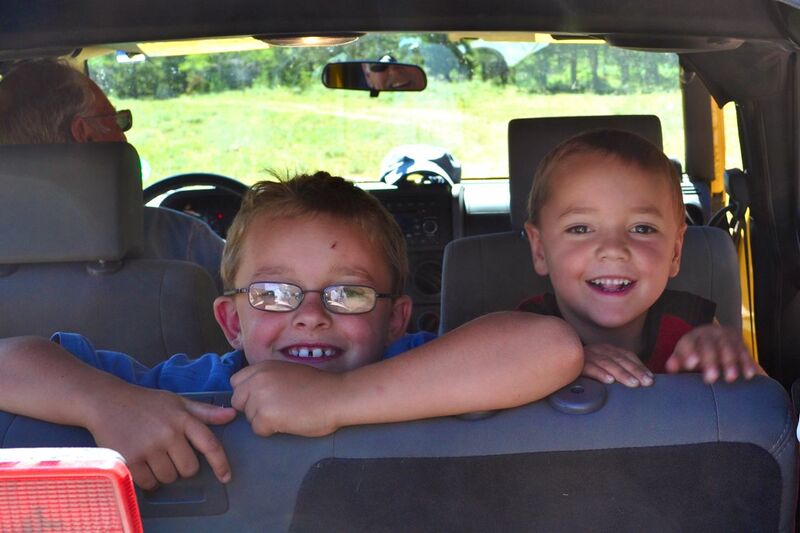 Sammy and Grady were all smiles as they rode along with grandma and grandpa. 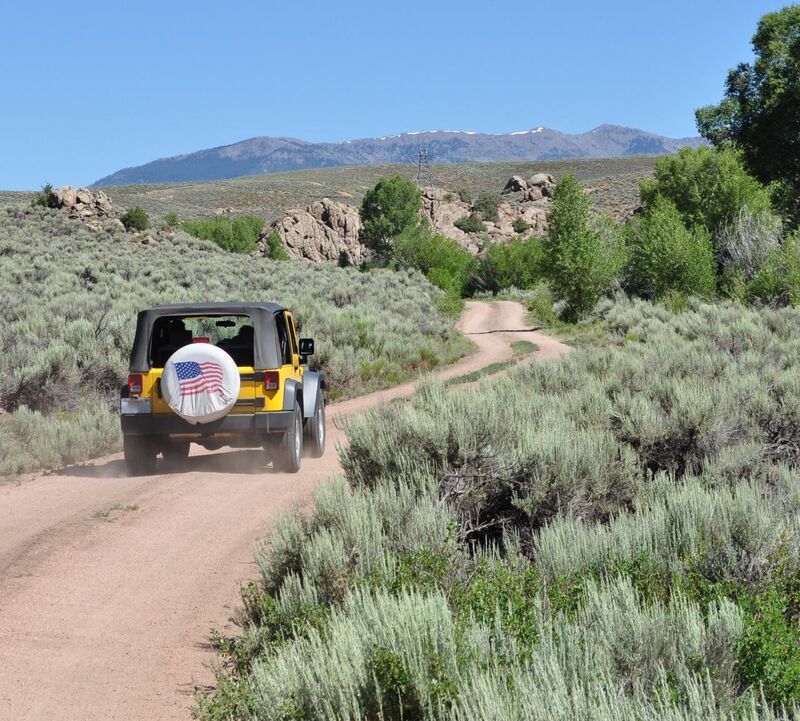 One of the best things about having a Jeep is the chance to enjoy views like this one. If anything is worth 30 minutes on a rough Forest Service road, this certainly is! Even on a hazy day, this is one impressive vista. These days, we're longing for a four-door squirrel, which would make it much easier to carry a couple of friends. We got a kick out of watching the boys bound out of the Jeep at each stop and then climb back in. 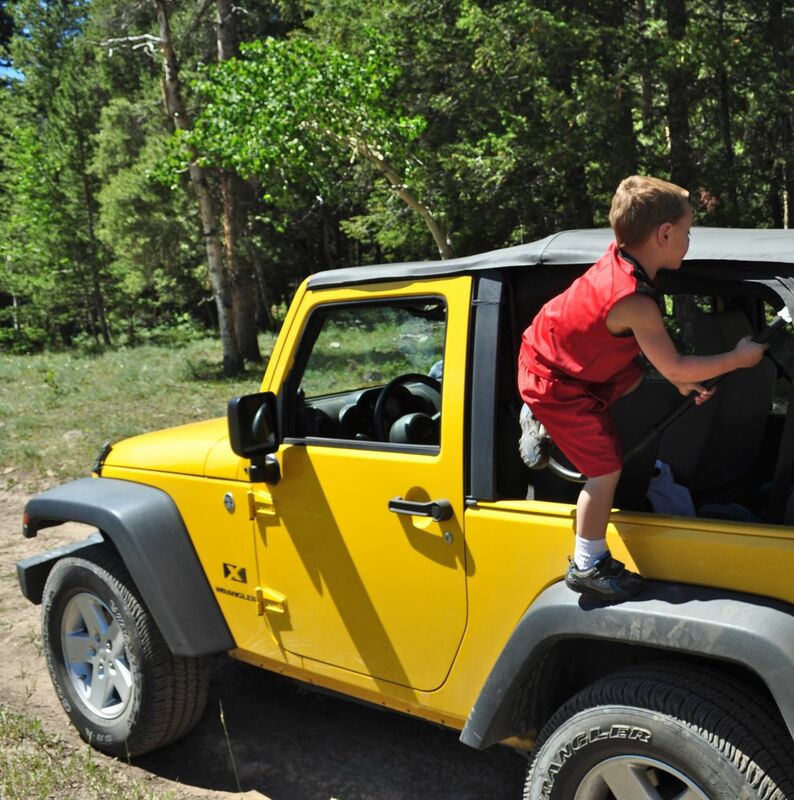 When you're four, who needs doors? After a stop for lunch, we finally made our way to the town of Pitkin: Population 66. 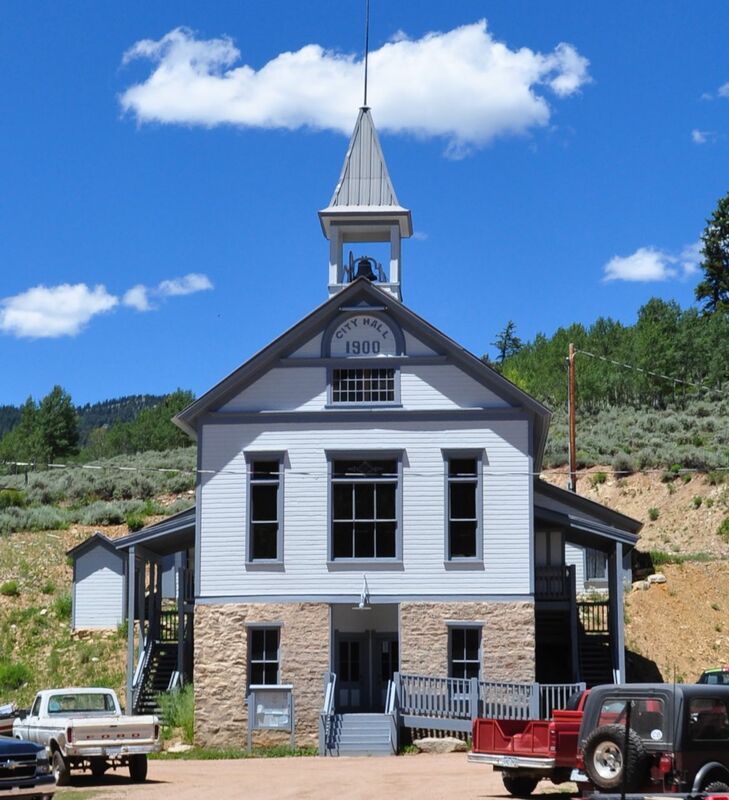 At an elevation of 9,216 feet, this one-third square mile alpine town is quiet in the winter. But, the place booms in the summer months, when a couple of hundred people call Pitkin home. 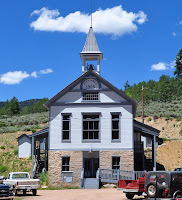 On this sunny afternoon, Pitkin City Hall looked like it was the place to be. 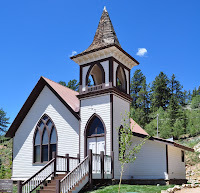 Founded in 1879 as a mining camp, Pitkin boasted three churches by 1881. 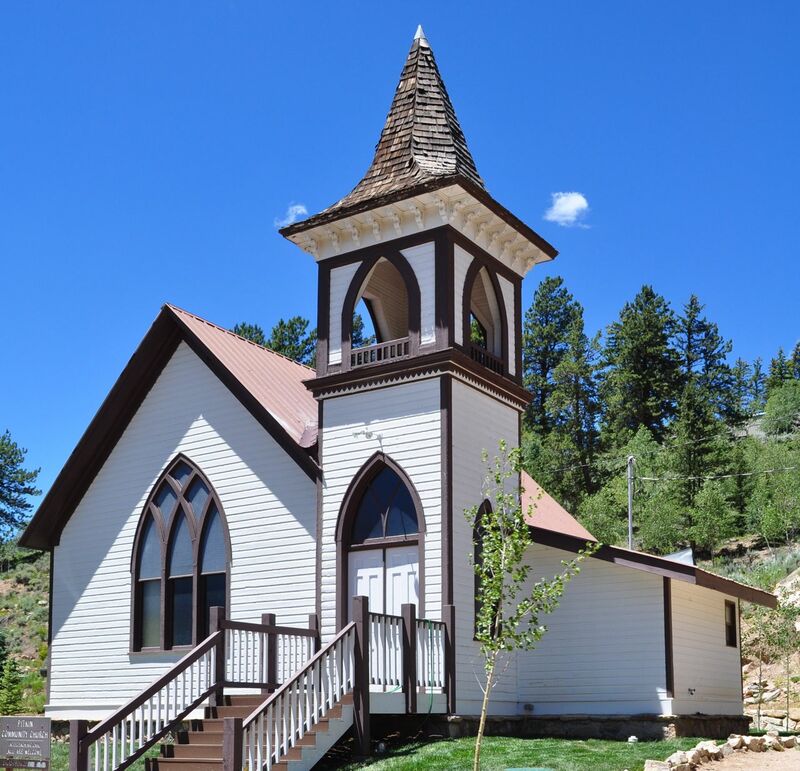 Today, the Pitkin Community Church provides an interdenominational service each week. 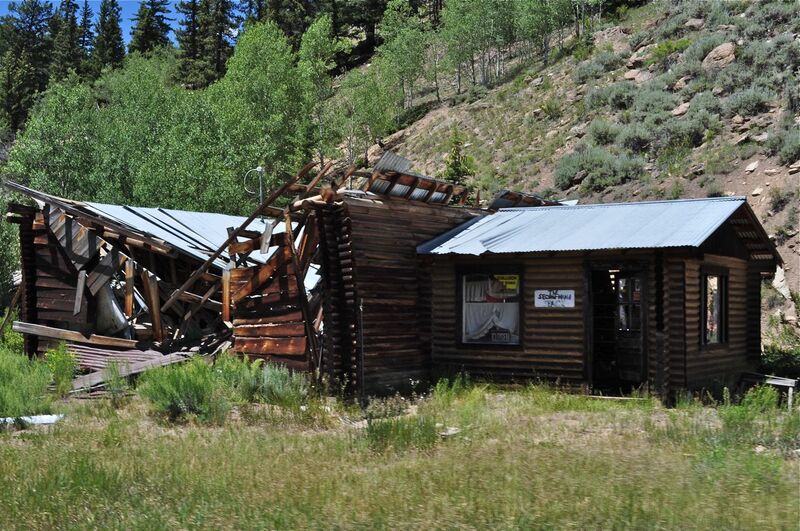 Many of the structures in Pitkin have seen better days. 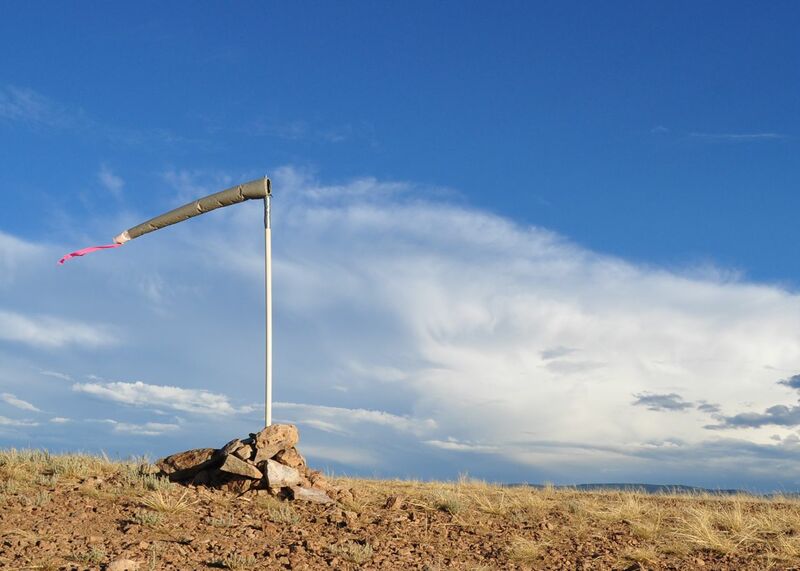 They are a powerful reminder that life high in the Rocky Mountains can be rough, to say the least. 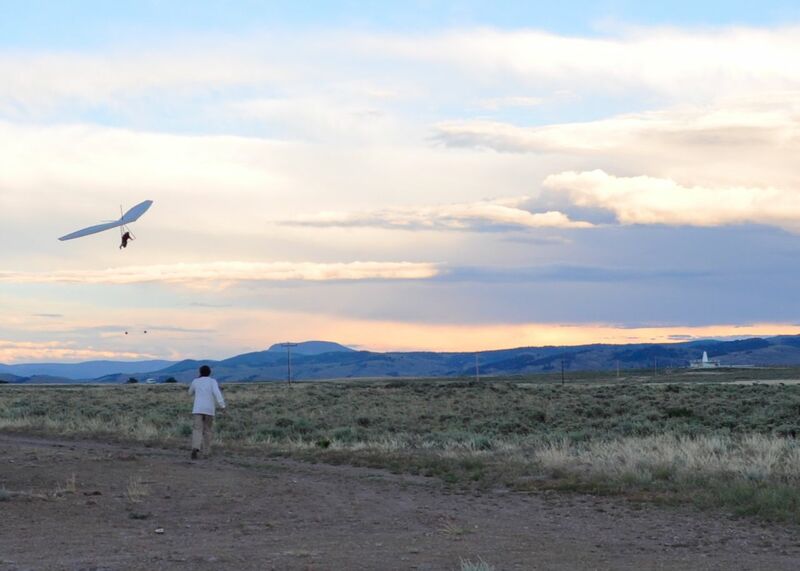 These days, there's not a lot to see in Pitkin. But, as we discovered, getting there is more than half the fun! This is the only picture I have from this stop. 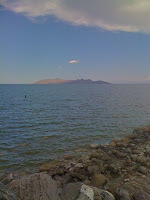 One quick look at The Great Salt Lake. I took others. The Mormon Temple. The State Capitol. But, they're gone. They vanished somewhere between my camera and the computer. There's some poetic justice in this mystery. You see, we weren't planning to stop in Salt Lake City. Now, it's like we weren't ever really here. Our unplanned stop had one purpose: Get our house heat pump checked out. We found a certified service dealer, called and made sure they could do the work and drove 288 miles to the dealer. Like our pictures, the trip to the dealer was a bust. 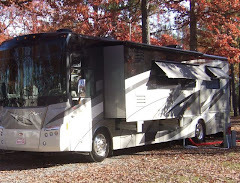 The only thing we can say is avoid Blaine Jensen RV in Kaysville, Utah, at all costs. 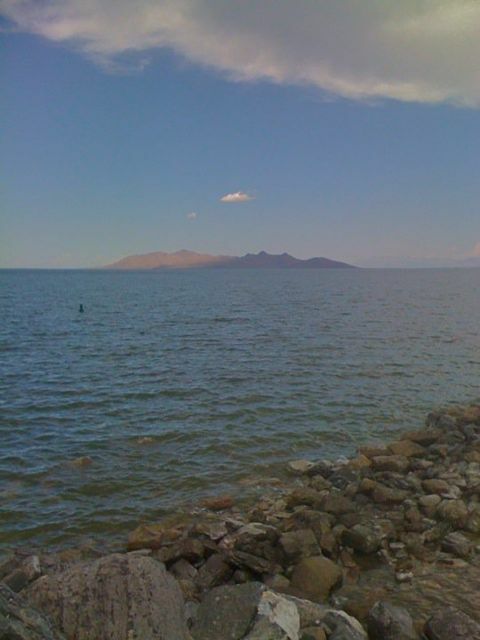 That experience pretty much soured us on Salt Lake City. We sat around in the shade of the KOA for the weekend and tried to cool off. The absolutely best part of the stay was a nice happy hour tonight with Sharon and Fred, our neighbors from Zion River Resort. Unfortunately, we didn't get any pictures of that get together. We were having too much fun. Tomorrow, SLC will be a vague and distant memory. We're heading someplace cool! 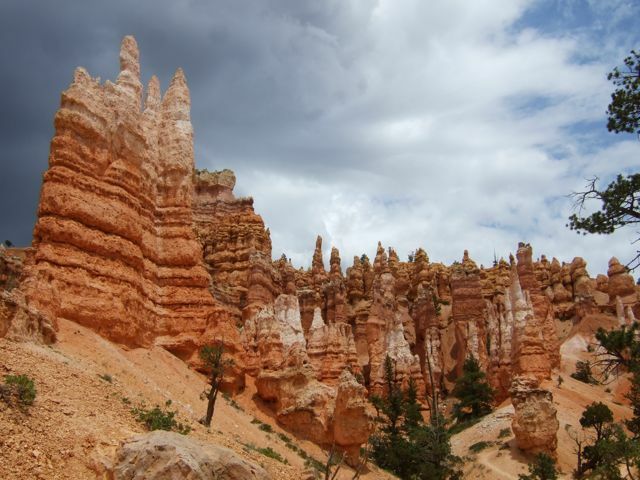 Over the last five days, we've Jeeped, hiked and shuttled around glorious Bryce Canyon. Along the way, we've taken a zillion photos. It's just that kind of place. This post is a feeble attempt to sum up our visit and illustrate the highlights of our new-favorite National Park. 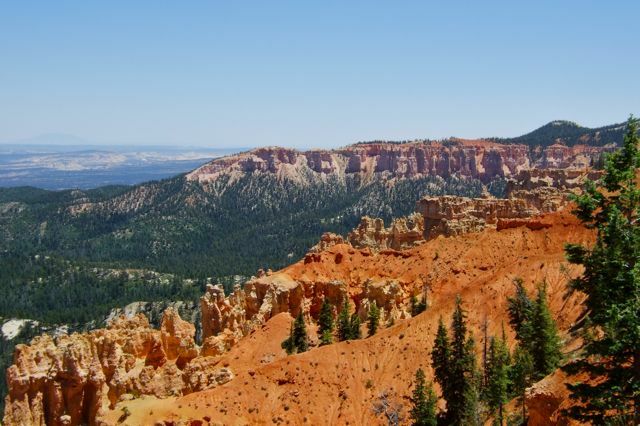 The best way to see Bryce Canyon is to start at the top, up canyon, and work your way down. We started with a Jeep ride to this farthest and most photogenic spot, Rainbow Point. 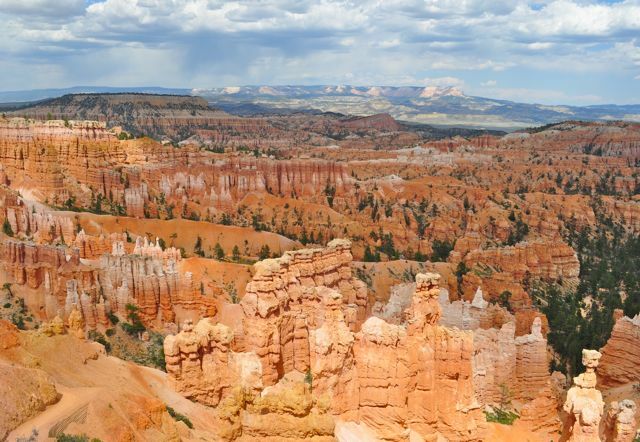 At an elevation of 9115 feet, this view will definitely take your breath away. 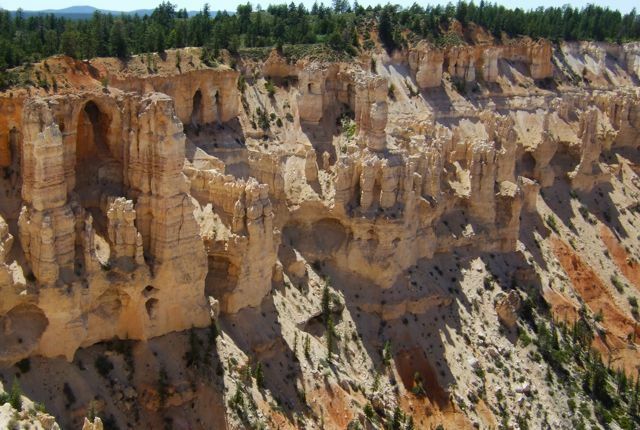 The next viewpoint is Black Birch Canyon. 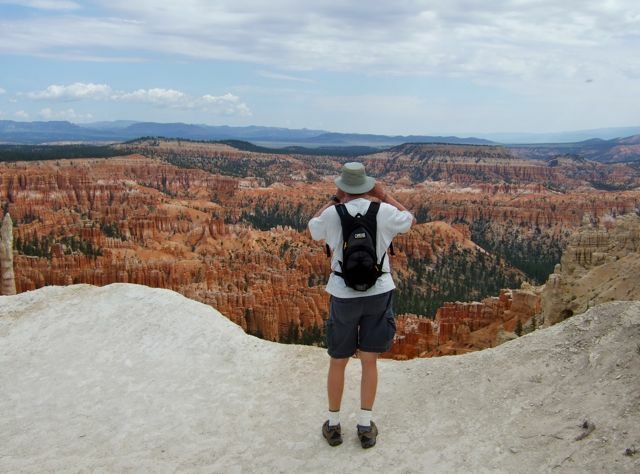 We gave ourselves one tough assignment to pick just one photo from each viewpoint. Ponderosa Point offers a sweeping view of Ponderosa Canyon. 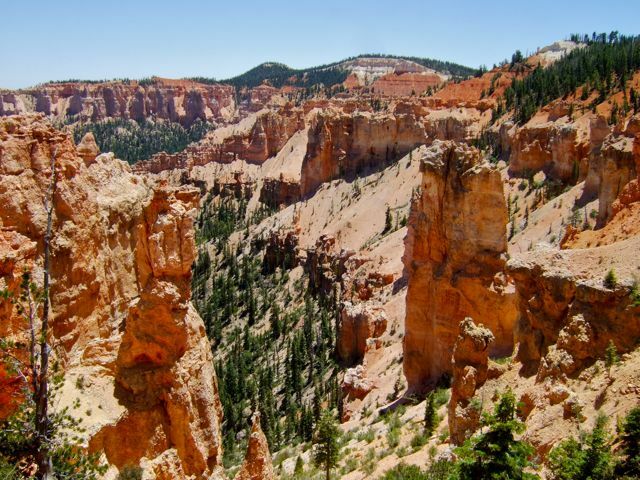 The canyon is aptly named for the towering Ponderosa Pines on its floor. 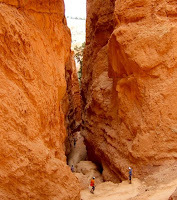 The next stop down canyon is Agua Canyon. The taller formation on the right is known as "The Hunter". We didn't see the resemblance, but we definitely appreciated the view. 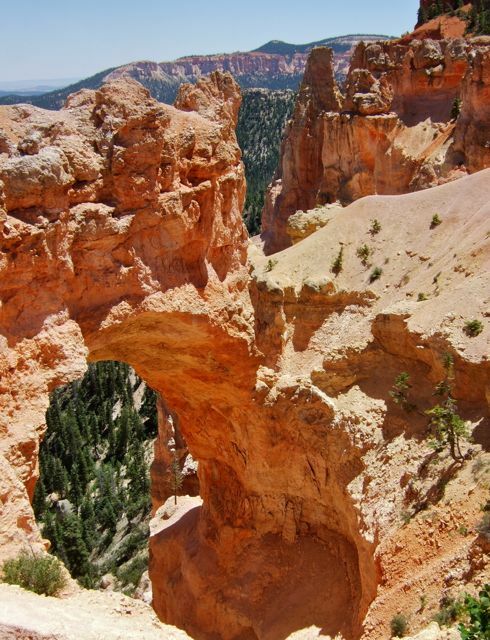 When we reached the Natural Bridge viewpoint, we chimed in unison, "That's not a bridge, it's an arch." Yes, this is one of several arches in Bryce Canyon. And, yes, it's official. 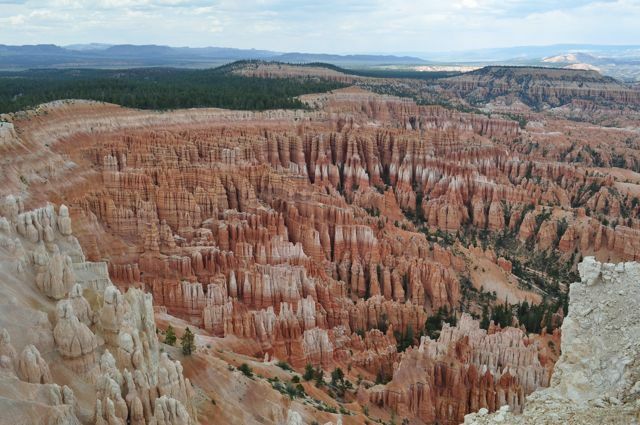 We've spent so much time in this beautiful state we're becoming geology geeks. Farview Point is appropriately named, indeed. On a clear day, you can see for some 160 absolutely stunning miles. 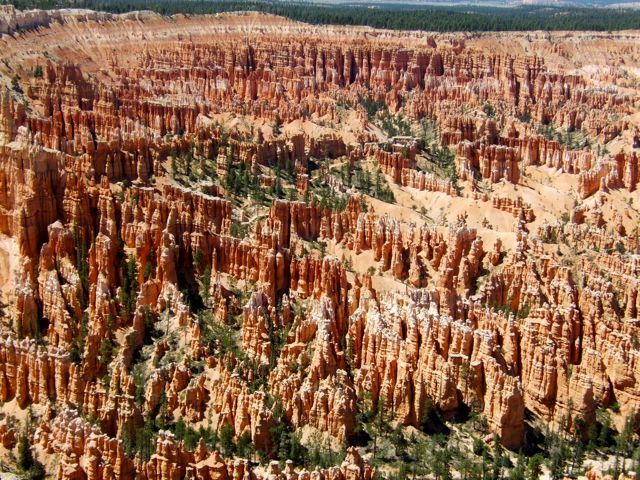 Lest you think we were the only folks visiting Bryce Canyon this holiday weekend, this was pretty much the scene at every viewpoint. There was quite a crowd of shutterbugs at Farview Point. From Farview Point we left the crowds and took a very short hike over to Piracy Point. There, we got to enjoy the view to ourselves. We couldn't see anything that resembled a swamp at the Swamp Canyon Viewpoint. The two creeks at the base of this canyon make this the wettest spot in the park. 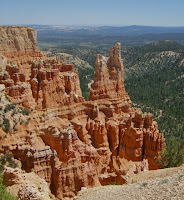 The castle-like hoodoo at Paria View is the one formation in Bryce Canyon that faces the setting sun. It was hours from sunset when we stopped by and enjoyed this gorgeous afternoon view. 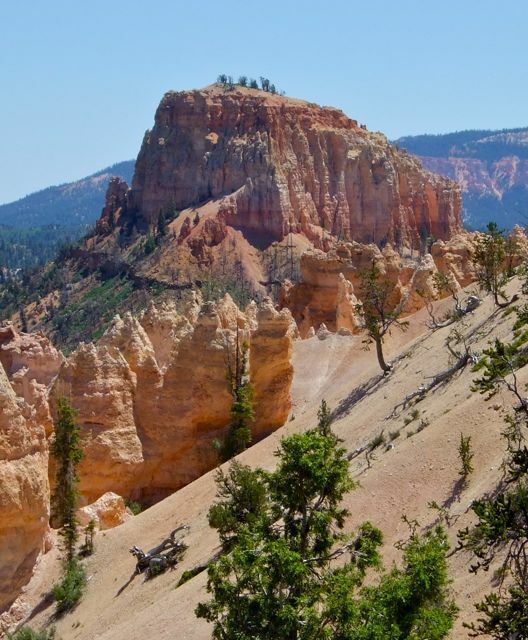 At Bryce Point, there are hoodoos everywhere you look. This is the place to catch a glorious sunrise. 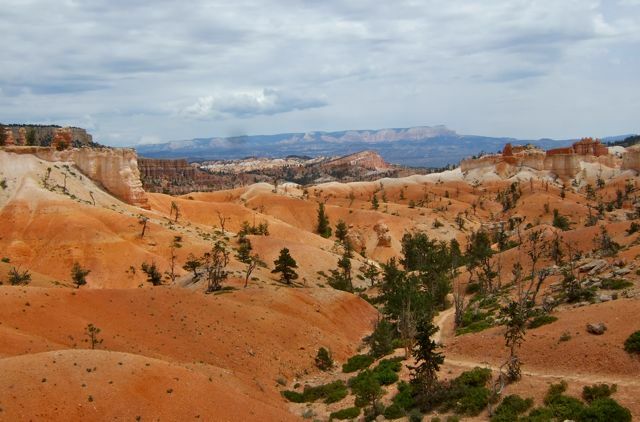 The canyon's namesake, Ebenezer Bryce, reportedly described this amazing sight as "a hell of a place to lose a cow." 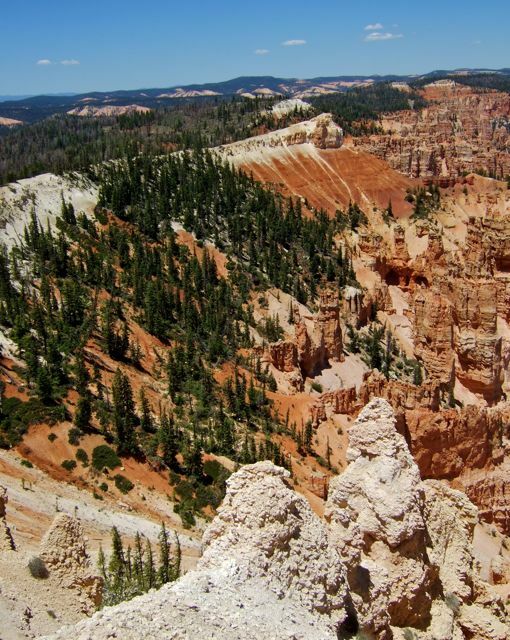 We broke our own rules for this post with this second look at Bryce Point. The grottos, as they are known, guard the canyon walls in stark contrast to the rugged red hoodoos. 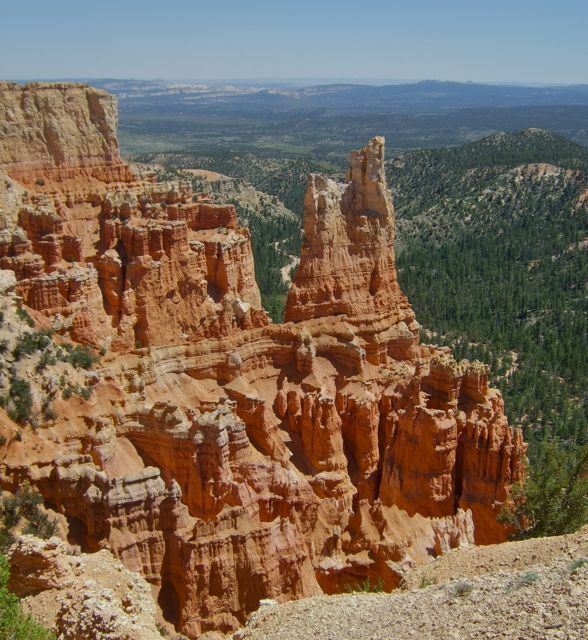 Bryce Point is the farthest viewpoint served by the park shuttle. 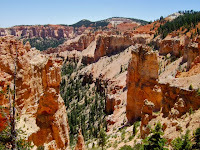 We donned hiking gear, rode to the end of the shuttle line and hopped on the Rim Trail for a hike down the canyon. Nothing like a scenic morning hike at 8300-feet to get your heart pumping! The Rim Trail gave us a chance to enjoy Bryce Amphitheater beyond the crowded viewpoints. Between Bryce Point and Inspiration Point, we shared the trail with just a few hikers. 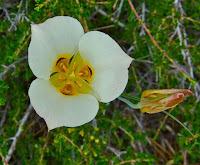 With all of these scenic vistas, sometimes we had to give our eyes a rest and enjoy the wildflowers along the trail. 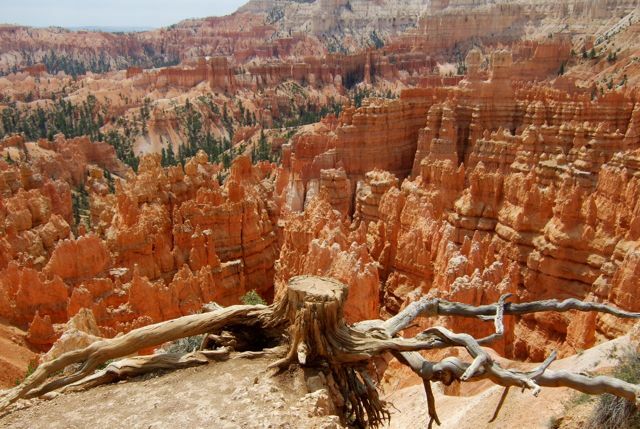 We wondered what the story was with this tree stump perched on the rim near Inspiration Point. 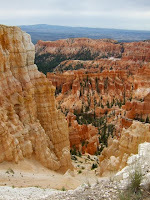 Even in less-than-flattering light, Inspiration Point is pretty inspiring! 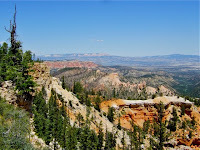 We continued along the Rim Trail to Sunset Point, which looks good any time of day. 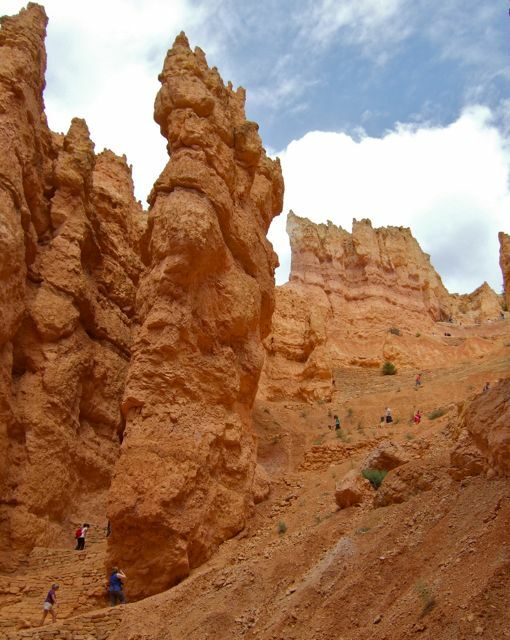 At Sunset Point we left the rim and climbed down into the canyon along the Navajo Loop Trail. It was a long hike down. How do we know? We kept looking up! And, as every hiker knows, when you take a trail down sooner or later you must hike up. 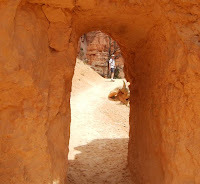 When we reached the bottom of Navajo Loop we realized the rest of the "loop" to the top of the rim was closed. Not exactly wanting to go back up the way we came down, we opted to hike the Queen's Garden Trail. 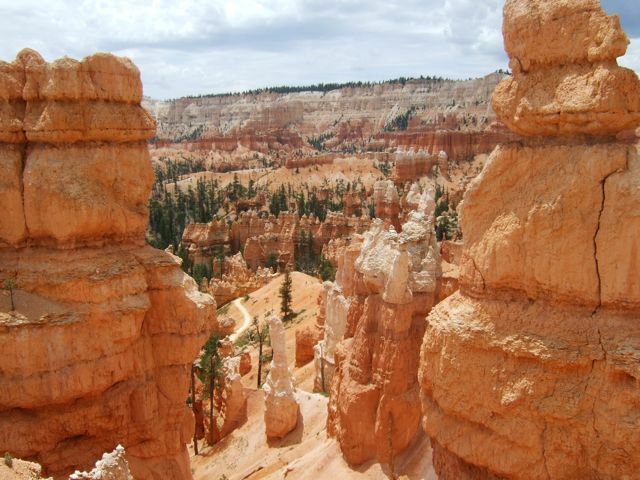 Seeing the hoodoos from this level gave us a whole new appreciation for them. Who is that waiting on the other side of this skinny little arch? It's Paul, the worlds most patient hiker! 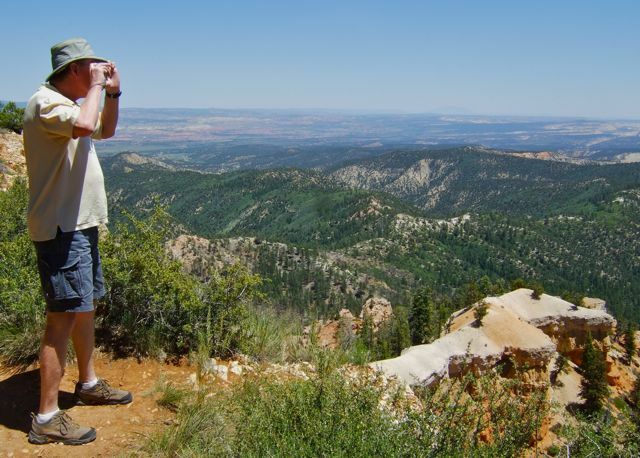 And, I wonder why he calls me "Ansel" on the trail. 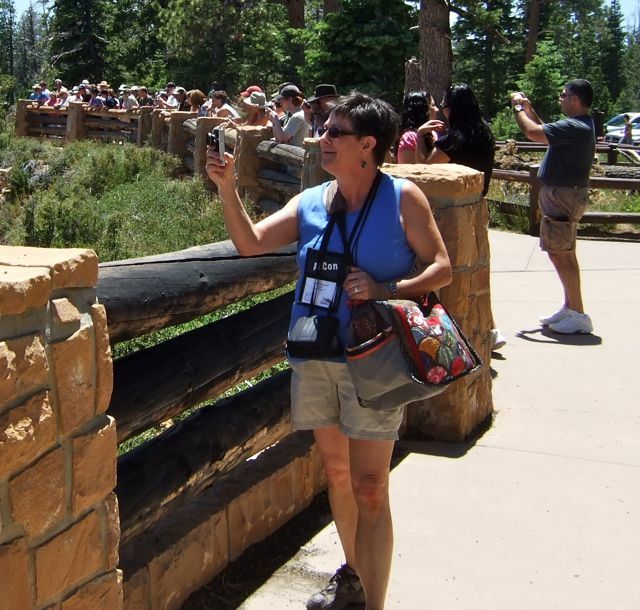 Yes, I'm always taking pictures! The climb back up the rim gave us a unique view on our last remaining viewpoint: Sunrise Point. This hoodoo view as we approached the rim had one purpose. It was a much-needed place for us to sit and catch our breath. After nearly four miles on our feet, we were happy to catch the shuttle at Sunrise Point and return to Ruby's just in time for an afternoon thundershower complete with pea-sized hail. 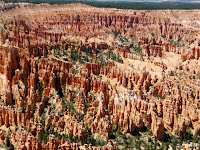 Our days in Bryce Canyon inspired us to make plans to spend a few days camping in the North Campground. 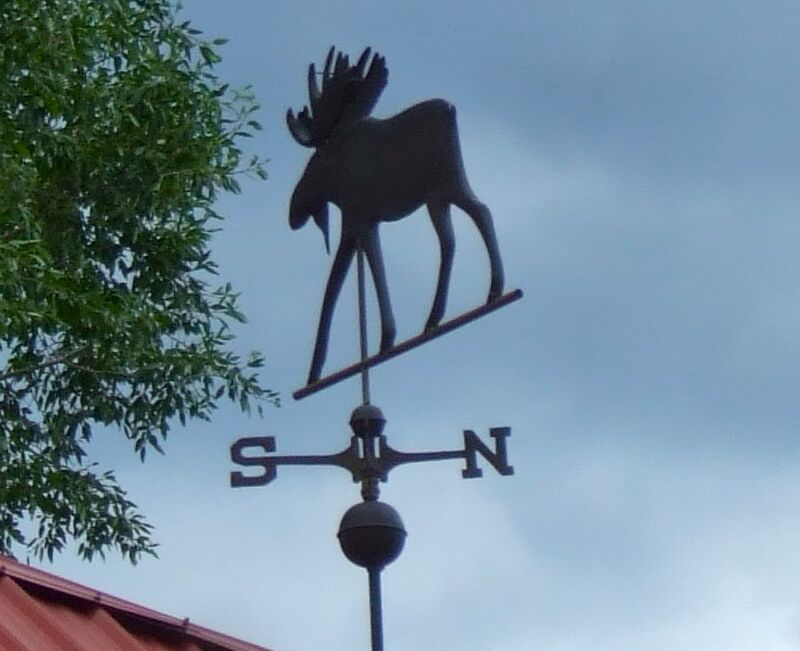 But, Bullwinkle's heat pump is acting up, so we're changing our plans. 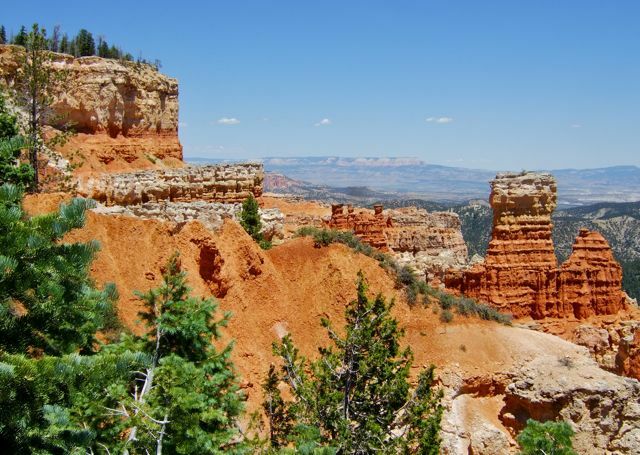 Instead of settling in to a rustic campsite in the park, we're hitting the road for Salt Lake City for repairs. Our date with the North Campground will just have to wait.